Markets look set to end a lackluster first quarter on a positive note. Investors are hoping stronger economic data and fading geopolitical risks will help stocks resume their five-year run higher. 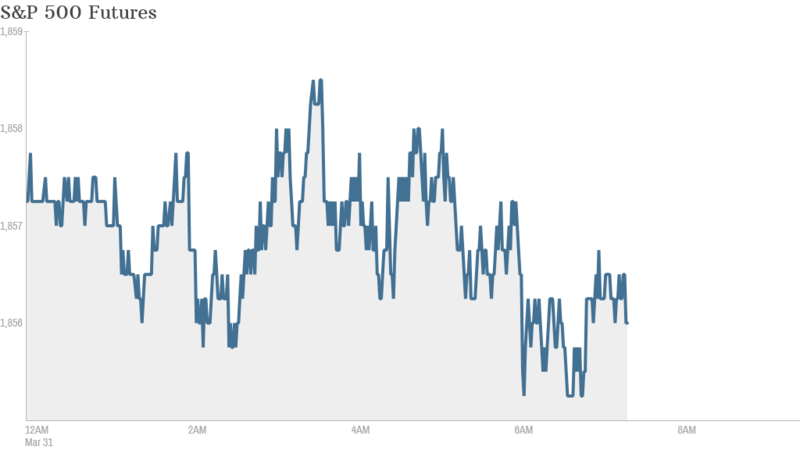 U.S. stock futures were pushing up ahead of the open. There is little economic or corporate news on the docket Monday, but investors are gearing up for a busy week which concludes with jobless data Friday. The Dow, S&P 500 and Nasdaq all ended Friday less than 1% higher. The Dow was the only major U.S. index to end the week in positive territory after a decent 60-point rally on Friday. The S&P has eked out a gain of 0.5% over the year to date, but the Dow remains stuck in the red, still down 1.5% during the quarter. In corporate news, Blackberry (BBRY) shares fell in pre-market trading after the struggling smartphone maker received a series of analyst downgrades Monday morning. After enjoying an early boost in 2013 on hopes of new CEO John Chen's turnaround strategy, Blackberry has tanked in recent days despite reporting a narrower-than-expected loss. Google (GOOAV) shares edged up a day ahead of the tech giant's much anticipated 2 for 1 stock split in which shareholders will get another share for each one they own currently. The stock split was first announced two years ago, but was held up by a legal battle in which some shareholders raised objections. European markets were mixed in midday trading, following lower-than-expected eurozone inflation data released Monday. The weak number is likely to revive talk that the European Central Bank could act Thursday to boost the economy. Asian markets ended mixed. The Shanghai Composite dropped 0.4% as investors wait for clarity from Beijing on possible new stimulus measures. The benchmark index has lost almost 4% this year on worries over slower economic growth in China.